This beautiful home “Shore Enough” has room for everyone! You’ve discovered the unforgettable seaside town of Mexico Beach, located on Florida’s “Forgotten Coast.” Our secluded town, just 20 minutes east of Panama City Beach, offers the same white sugar-sand beaches and emerald waters, without the crowds and over-development found elsewhere. A well-guarded “secret” vacation spot of families for generations, Mexico Beach is a time capsule of living memories that hearken back to the way it used to be. Long, relaxing days on our uncrowded white-sand beaches, genuine mom-and-pop restaurants and shops, and some of the best sport-fishing in the world are waiting for you in Mexico Beach. Beautiful house with plenty of room for our large family. Comfortable beds. Very clean. Really couldn’t enjoy the outdoor area because mosquitoes were fierce, so be prepared. Easy walk to the beach. Our kids especially enjoyed it. Thank you so much for your feedback. Glad you enjoyed your stay despite the mosquitoes, trust us if we could do something about those pesky creatures we would! We hope to have you back! The house is beautiful! Love the gazebo with the ceiling fan in it - makes sitting outside grilling in the summer very nice! Our family had a great time! The upstairs dryer doesn’t work well - took 3 cycles to dry a load, and the downstairs washer is broken - won’t cycle properly or spin water out. Water dispenser on fridge just trickles water, and we made sure the cut-off valve was open. Kitchen needs more cooking supplies, i.e. large non-stick skillet for frying bacon, sausage and making scrambled eggs, cheese grater, cereal bowls, dish drying towels and pot holders to remove things from oven (only had one dish towel and one dish cloth-no pot holders). Dishwasher needs to be replaced - doesn’t clean well at all, no matter what setting you put it on. Had to re-wash dishes - not fun on vacation. If those issues would be addressed, this place would be excellent. Therefore, I can only give 3 stars. 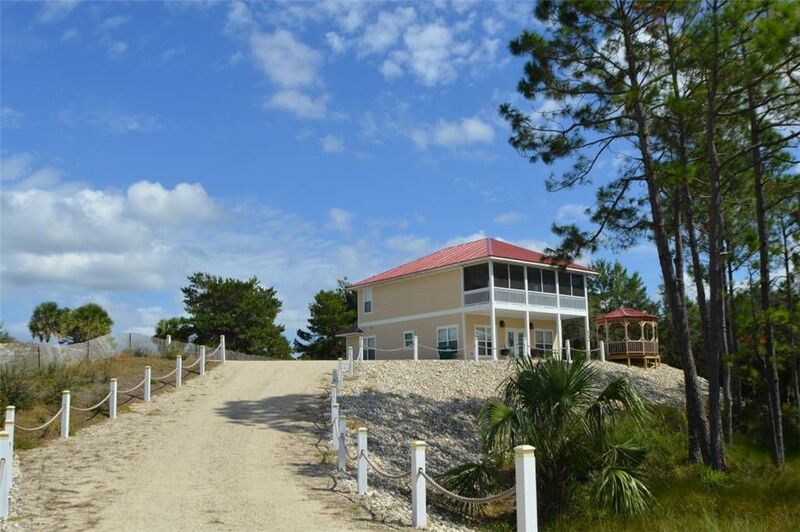 Beautiful, immaculate home in a private central location just a short walk from the beach. Perfect family friendly house with playground and park practically in the backyard. Thoroughly enjoyed our stay! The Forgotten Coast group were extremely helpful and quite reponsive. the house was clean and as described on the website. I'll be back and my first stop in planning will be the Forgotten Coast Rental group. We LOVED this place. The house was beautifully decorated. Perfect location and had plenty of room. Will rent here again in the future. LOVED IT !!! Gazebo was a plus.